Marketing is a word that can morph and evolve based on the whim of the person wielding it. But if you cut to the core of the word, the idea is simple: identifying a market for your product or service and communicating its worth to that market, including both internal staff/stakeholders and external audiences. Meaning set aside, the question now becomes how to best communicate that worth to a certain market? 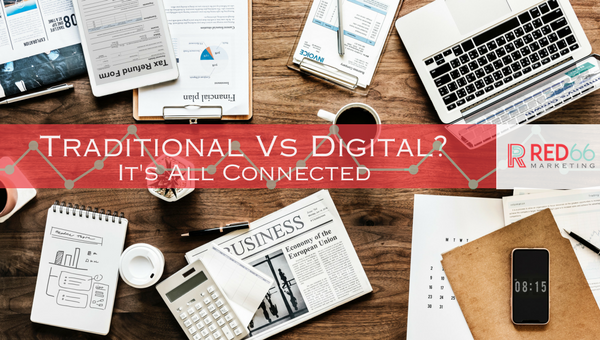 This is where traditional vs. digital marketing tactics come into play, and at RED66 Marketing, we would argue that at the end of the day, it’s all the same darn thing. Many argue that digital marketing has taken over, and the ideals behind traditional marketing methodology are null and void. Our mantra is that a website represents the core or HUB of your marketing communications. This is where prospects find you via search, where people go when they hear about you, have a business card, or connect with you on any social media channel. BUT, take a step back, because one singular website (no matter how polished) isn’t going to do much for you unless it’s part of a more comprehensive marketing plan. In other words, IT’S ALL MARKETING. In our opinion, the old days of traditional media, new media, digital media – are gone. It’s all just marketing. The latest buzz is “integrated marketing” – of course, it has to be integrated otherwise it’s just fragmented and inconsistent. Whether online or in a magazine, the most important channels are going to be based on where your audiences are. Maybe your audience is B2B quality control experts who aren’t online that much. No problem, what are some popular publications they subscribe to? Or, perhaps your ideal audience is fully immersed in the digital world, that means the best way to connect is via social media, blogging, search, and email. Let’s get you connected to them and positioned as a valuable source of product or service solutions in a specific marketplace. Regardless of print, digital, radio, or video, it’s all about developing relationships with the right audience and making every effort to put your best foot forward. Yes, much more is done digitally today, and we are experts in that field; but understanding the fundamentals of marketing strategy and applying that to business objectives is the most critical element. No matter the medium you choose to focus on, the traditional ideas surrounding consistency in brand, identifying target audiences, and creating meaningful, relevant content still hold true today. Learn more about our marketing services or give us a call today to start the conversation. We’d love to learn more about you.